Please note: The phone number above is a business number for use by the media, show producers, event coordinators and retail store owners ONLY. Please do NOT call this number to talk with the Duct Tape Guys! This phone number reaches their manager/agent. 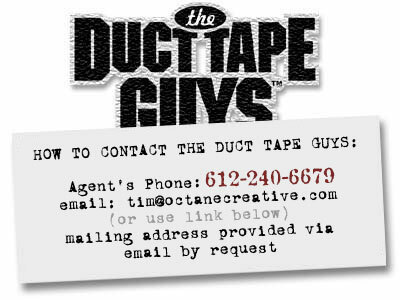 If you wish to communicate with the Duct Tape Guys, use this link: . Thank you. Media: Click here to get on our email notification list! Indicate that you are a member of the media to get the proper notifications.